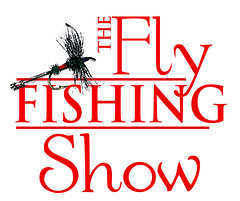 This weekend brings the Fly Fishing Show to the Garden State Exhibit Center in Somerset, NJ. This is the best fly fishing show you can find and a great opportunity see what the latest and greatest is going on in the industry. For those of you that have not made the trip before it is a three day event that includes a very large exhibit floor, fly tiers, retail shops, educational programs and more. Many members from Paflyfish make their way to the show every year. Here is a link to a video and recap of the show in 2014. If you are looking for trips, rods, reels, flies, waders any gear or tying materials this is the show to hit. There are many outstanding presentations about fly fishing techniques and locations to attend as well. I enjoy going to the show to see a lot of good friends that end up there every year. Justin and team from Allen Fly Fishing can always be found at the show. Tom "afishinado" Ciannilli at the Orvis booth on Saturday. Guides and tiers from the site like Mike Heck, Dave Allbaugh, Rick Nyles & Nick Raftas are there at booths. Details can be found on the Fly Fishing Show website. If you can't make it this weekend there is the Fly Fishing Show in Lancaster on February 28 and March 1, 2015. A little smaller venue, but a good very good show as well.